It seems like a silly time to take a break -- there are so many great conversations starting here! But I'm off to California until Saturday, and as it's the only time I get to see my family during the year, I probably won't have time for blogging. Please continue your interesting comments -- I look forward to engaging with all of you when I return next weekend (and I'll reveal who made the plane-reading cut). Happy reading! I was making coffee and listening to NPR this morning when my partner (and several surrounding apartments) might have heard me say "WHAT?!?" I had just heard that William Vollman's EUROPE CENTRAL had won the National Book Award for fiction. The announcement was made as a kind of footnote to Joan Didion's win in nonfiction for THE YEAR OF MAGICAL THINKING (which was almost a foregone conclusion, and must make things strange for her, as the award comes at the cost of the deaths of her husband and daughter). To be honest, I had forgotten that Vollman had even been nominated for the award -- I had glanced at EUROPE CENTRAL when it came out in hardcover and shuddered at how difficult it looked, filled with respect for those who would tackle its 800 pages. And my surprise (and initial indignation) came from the fact that he's not only difficult, but very little known, and it seemed like a purposefully pretentious choice on the part of the judges. But as I look back at the nominees, I realize there's not really anyone I think should have won instead. Doctorow's MARCH (the only mainstream bestseller) was clearly the favorite, followed by Gaitskill's VERONICA, but I haven't read either or felt any desire to do so. Steinke's HOLY SKIRTS is the only one I know much about, since it's a fictional biography of insane genius Dadaist model perfomance artist New Yorker Baroness Elsa. And Christopher Sorrentino I've heard spoken of respectfully, but he also seems dauntingly difficult. "Anyway, the winners will be the obvious choices, authors who have already won plenty of prizes and acclaim, in which case what's the point? ... Either that, or the winners will be people nobody outside a tiny elite has ever heard of... in which case . . . well, see above." Vollman falls into the second category, obviously, but when one honestly considers the options, that doesn't seem so bad. Sales of his book will likely spike briefly, and perhaps longer if it gets good word-of-mouth from average readers. As a bookseller, I am more likely to have positive feelings about literary awards because of this fact, regardless of fairly or arbitrarily they are awarded. But it does matter whether the books deserve their prize, if only because the award itself needs to maintain its value and integrity. If the NBA winner veers one year toward the commercial and the next toward the obscure, perhaps that's for the best in order to strive for balance and interest readers of all kinds each year. In my long-held opinion, the lists of nominees for book awards are more helpful and indicative than the actual winner. The shortlist of nominees this year obviously contains some serious writers whose critical reception suggests they deserve a wider readership, at least among those interested in the heavy stuff. Maybe I'll even give Vollman or Sorrentino a try myself. I have a long plane flight coming up, and if they don't keep me interested, maybe they'll help me sleep. Congratulations to all the winners. I'm especially pleased that Merwin won the poetry award -- I'm a fan of his work, and while I haven't gotten a chance to get to MIGRATIONS yet this will be a good motivation. 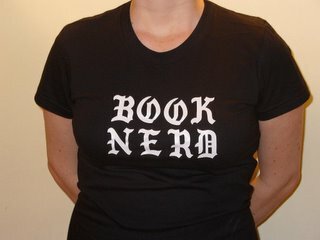 We booksellers will happily be selling all the winners through the holidays, and hoping their reputations continue to grow. Chronicle and Comments: KGB & J.T. Last night I made an appearance at KGB Bar on East 4th Street for a goodbye party for an editor. She's graciously accepted my book reviews (and paid me) for a couple of years, and is now migrating west to work on her already-sold novel, so I thought it would be nice to stop by and show my face, since we'd never met in person. I hadn't been to KGB in a couple of years -- I used to go often when I was at NYU, since a professor of mine ran the Monday night poetry reading series. There's a gigantic neon "KGB" sign outside, and a set of stairs just inside the door. The first floor is a small theater, and the bar is on the second. It's just one room, all read, decorated with old Soviet propaganda posters and stencils of Lenin. Strangely cozy, in an ironic sort of way. My former editor introduced me to my new editor, and we chatted for the duration of a long glass of wine. He looked tired (he's doing two people's work at the moment), but very wryly funny. As is my wont, I chattered on about bookstores -- he loves the store where I work now (maybe more than I do). When I started to tell him about my plans to start an indie of my own in Brooklyn, he asked if I'd like to write a piece about my quixotic struggle to open a bookstore. Of course I would, though I haven't gotten very far in the process yet. But I'm definitely going to start taking notes. As for his suggestion that I could get a book or two out of this -- maybe a little overambitious, even for me. In other news, the blog of Atomic Books (one of the coolest new indies that I know about, at least based on their website) points out the debate over the reality of cult favorite author J.T. LeRoy. Apparently this article in New York Magazine has prompted the New York Times to stop publication of some articles they'd commisioned from LeRoy, on the grounds that he may be a made-up person. I sold books at a J.T. LeRoy event a couple of years ago at Fez Cafe. Since the author is reportedly too shy to read from his own book, there were some fun literary celebrities reading from his book, including Michael Musto and Arthur Bradford. My friends and I speculated about whether J.T. might have made a covert appearance, as he supposedly often does. We identified a frumpy-looking woman who might have been a young man in drag. Then again, she might have been a frumpy-looking woman pretending to be a young man in drag, or a young man in drag who is not the author of J.T. LeRoy's books. I'm sorry to be reviewing something that isn't available to most outside the publishing community for a couple of months, but I wanted to get my thoughts down before they fade. This is a book I read in one day -- an extremely rare thing, and like the books that make you miss your subway stop, a good indicator of how compelling this novel was for me. I'm a Paul Auster fan, though I started late with THE BOOK OF ILLUSIONS and ORACLE NIGHT, and am only now coming to some of his earlier work (I have yet to find the time to sit down with the NEW YORK TRILOGY, though it's high on the list of non-new releases I want to read). He seems to me an eloquent storyteller of the city, with plots that sometimes seem modeled after New York streets; he's unafraid of lots of plot, and he sometimes lets his characters get stuck down a dark alley or around an unexpected corner. He's the kind of "postmodern" writer I like -- intelligently having fun with the freedom to use all genres, all voices, all non-traditional structures in the service of something powerful and pleasurable. This new novel is actually a lot less dark than his two previous novels, and from what I've gathered than his previous work as well. Maybe he's been spending more time in the sunnier borough of Brooklyn, where he makes his home -- this is a novel of neighbors and neighborhoods, not of anonymity and bleak high rise rooms. The story is narrated by a retired insurance salesman, Nathan Glass, who grew up in Brooklyn and has returned there, half jokingly, to die. Glass is divorced, had cancer but beat it, and is planning to live out his remaining days in comfortable solitude. But an encounter with a long-lost nephew, the nephew's charismatic employer, and the sudden appearance of a child without her mother (another relative) hurtles him back into the world of relationships and dramatic goings-on. The plot is breathtakingly suspenseful, but never dips too deeply into darkness, and with a few exceptions, things turn out much as everyone would like, though not necessarily as you'd expect. Throughout the book, the characters discuss an idea they come to call the Hotel Existence: a real or imaginary retreat from the problems of the world, where all of the luxuries and interests you can imagine are there in a place of safety and companionship. At one point it is suggested that a Vermont hotel may be the embodiment of the idea, but I think for Auster the real Hotel Existence is Brooklyn itself. All vices and desires are represented there, but the strong fabric of the neighborhoods and the enduring hominess of the architecture, and all of the other indeterminable factors that make the borough "the world's biggest small town," mean that in some ways Brooklyn (at least the Brooklyn these characters live in) is both a safe retreat and a place to become deeply involved and fulfilled. Incidentally, I tend to feel the same way about Brooklyn. It feels more like a hometown to me than anywhere I've lived since my childhood -- a place of traditions and of wild new possibilities. But even if you don't share the feeling, Auster's latest is definitely worth a read. Don't come looking for his traditional noirishness; just enjoy a grab-you-by-the-collar story full of meaty details and compelling characters that is as satisfying as a fat Dickens novel, with a very contemporary sensibility. On Halloween, Bookslut provided a link to an article by Alison Rowat in the Glasgow Herald titled "Why Amazon is the best thing to happen to bookselling." (It's now been archived; here is a link to the abstract, and I'm happy to email the entire article to anyone who requests it.) I forwarded it to my local booksellers listserve immediately for consideration, but I've been stewing about it ever since. My first reaction to Rowat's complete dismissal of independent booksellers as "fantasy merchants" and "dated as ration books" was so dumbfounded, so full of personal righteous indignation, that I didn't feel capable of gathering my thoughts for a reasoned response. Tonight, however, serving my quiet shift at the Brooklyn Superhero Supply Company (another quixotic venture I'll expand upon later), I feel ready to marshal my passion into the service of logic and offer my refutation of the points Rowat has put forward. First, I have to acknowledge that there is some truth in Rowat's defense of Amazon.com against the charge that it (along with Britain's Waterstones and America's Barnes & Noble) is destroying literature by offering nothing but blockbusters. As she rightly points out, Amazon makes a huge variety of books, both super-hyped and relatively obscure, available to would-be readers who don't have a local bookstore, or whose local bookstore doesn't carry what they want to read. This has been a boon for those outside of major urban areas in the same way that many, many aspects of the Internet and its age have been, and I don't begrudge Amazon its success, or those readers their books -- more power to them. But my argument comes down, more or less, to this (credit for the metaphor to my adorably literate partner and housemate, who helps me focus my ranting). Amazon is to an independent local bookstore what the liquor section of the grocery store is to a local pub. Heck yeah, the stuff at the former is cheaper, and they probably have any variety you could think to want. But you don't go to the latter for the prices or the convenience, do you? People visit there for the product, yes, but also for a good recommendation, for the serendipity of who or what you'll find there, for the soul-strengthening reality of being in a building, on a street, with other people. They go there for community. And they go there for the good stuff you can only get in small doses, with luck, from a friendly host. In my opinion, it's pretty easy to give Bellow to a Roth reader -- heck, a computer could do it. Both authors fit easily into a certain era and sensibility. But to suggest that a fan of Portnoy's Complaint might also enjoy the dark hilarity, sexual anxiety, and Jewish cultural subtexts of Daniel Handler's (aka Lemony Snicket's) under appreciated adult novel Watch Your Mouth? That takes more insight, and more time, than an automatically generated list of "matches" can provide. It takes a bookseller. Rowat found her book on Amazon, of course. The book has been culturally vetted, one of the few that achieve wide enough notice that it becomes a must-have, go-to item. But as many readers and booksellers know, awards or blockbuster status or cultural cachet can be fickle and arbitrary things, and many readable, important, thought-provoking, brilliant, original, worthy, and loveable books fall through the cracks. The only way to discover them is to get them from someone who really knows your taste -- or just to browse a good selection and see what you run across. These two things, community and serendipity, are the treasures available from independent stores which, for all its riches, Amazon cannot provide. For all its length now, my thoughts only scratch the surface of the online megastore/independent debate. Other voices have joined in the discussion of this particular piece: here, and here , for starters. (A quick Googling of Alison Rowat will reveal that her style and depth of coverage has made her more enemies that friends on previous occasions as well.) And I know that independents are actually gaining force and will to continue to find their place in a digital age, something I mean to chronicle here. Rowat compares Amazon to Dickens' publishing in periodicals, as "turning the technology of the age to his advantage." But buying well-known books from the standard online source isn't the same thing as creative use of technology. Independents will thrive as they bring their talents to the electronic age with passion instead of fear: with effective online ordering, websites full of their employees' unique recommendations, blogs to bring community and serendipity to a wider market. We don't need to hate Amazon for what it does. We need to do what we do better. Because what we do is irreplaceable. A good local independent bookstore may be the stuff of book lovers' fantasies. But it's also as real as the corner bar, and getting better all the time.